Start your day sailing from Kaiteriteri beach, soaking up the scenery along the stunning coastline, passing the iconic Split Apple Rock and the playful NZ Fur Seal colony. Take in the golden beaches, bays, islands and birdsong. Learn about the history, marine life flora and fauna from your knowledgeable skipper before arriving at Anchorage Bay around midday. Enjoy your own packed lunch on the beach (pre-ordered catering available) or take a swim before starting your self guided nature walk back to Marahau. Stroll along sandy beaches via picture-perfect lookouts and through native bush and the beautiful scenery the coastal track has to offer ( 3-4 hour self-guided walk). Note: Free morning transfers from Marahau provided*. 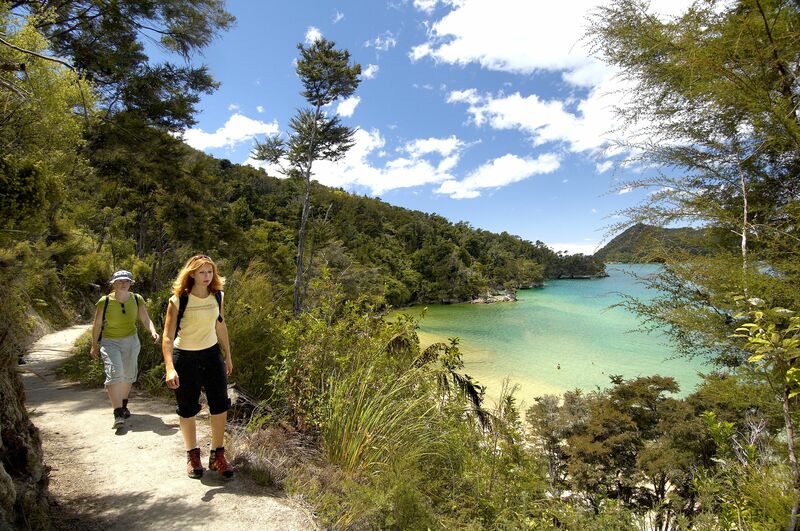 This provides you with the freedom to walk the coastal track at your own pace. Free all day car parking is available at the track entrance in Marahau. 10 am: Meet your skipper who will help you on board your sailing catamaran departing Kaiteriteri Beach for the Abel Tasman National Park. 12:30 pm: Arrive into Anchorage where you have time to explore the area before starting your freedom walk, following the clearly marked signs back to Marahau. 3 - 4 hours later: Arrive to the National Park Entrance. As you have parked your car at the National Park Entrance earlier that day, you are under no time constraints to complete your freedom walk. *Please confirm your free transfer from Marahau to Kaiteriteri at time of booking.